The words “root canal” have an unfortunately negative stigma attached to what is otherwise a treatment that alleviates more pain than it creates. Root canals are common procedures that, when done by the right hand, will help preserve your smile and the integrity of your original tooth as well as your surrounding gum tissue. A soft tissue (called pulp) located inside of your tooth, under the white enamel and hard layer (called the dentin), contains blood vessels, nerves and connective tissue. This pulp also creates the surrounding hard tissues of your tooth during development. Pulp extends from the crown of your tooth to where it connects to the tissues surrounding the root which makes it crucial to a tooth’s growth and development. 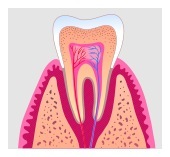 A root canal is necessary when the pulp tissue inside of your tooth’s root canal becomes inflamed or infected. This can happen for a variety of reasons, whether it is due to deep decay, repeated procedures on said tooth, or as a result of a crack or chip in the tooth. If you’re experiencing pain, prolonged sensitivity to heat or cold, tenderness to touch or chewing, tooth discoloration, swelling, or drainage and tenderness to the lymph nodes as well as nearby bone and gum tissue, then a root canal procedure from Tijuana Clinic of Cosmetic Dentistry may be for you. During your root canal, you will be given a local anesthetic to numb your tooth and the surrounding area. A small hole will be cut into the tooth, allowing access to your pulp chamber. From there, we will remove all of the damaged tissue and material, shaping and cleaning your root canals, leaving the tooth absent of any infection. Our dedicated team has an expertise that spans over a variety of specializations, endodontics being one of them. We’ll perform your root canal procedure with expert precision, ensuring you receive the most concentrated level of care possible. Call Tijuana Clinic of Cosmetic Dentistry today and we’ll schedule your one one one consultation. We have a capable staff of specialists who are ready to help you as well as cutting edge technology that will give you the most effective and efficient procedure possible. We look forward to helping you achieve optimum oral health. Dr. Shirley Baker uses the most advanced tools and endodontic techniques to provide you with the best care. She employs specialized instrumentation for a faster, more efficient procedure. Contact us to schedule for an appointment today.